Sunco offers certified data and telephone cabling — including Category 5/6/6e cable and fibre optic — for new builds, renovations, expansions and system upgrades. The right cabling will help your business make the most of its phone and data networks. With professional cable installation, systems are fast, flexible, reliable and easy to upgrade. Our cabling partners are all accredited by Leviton and Hubbell, the industry leaders in cabling systems. Our cabling partners use high quality test gear to ensure your system is safe, easy to troubleshoot and meets all specifications of Category 5/6/6e and multi-mode fibre optic cabling. Our voice and data cabling installations are labelled, tested, and certified so our clients know their systems are running at max efficiency. Moving offices and need cabling done? Call us for a free estimate! 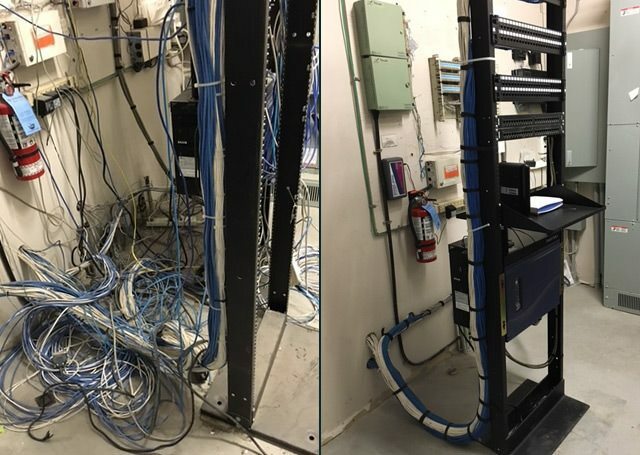 Check out an example of Voice & Data Cabling Before & After!